Welcome to the Animal Care Clinic! We’re located in the historic downtown area of Branson, Missouri. 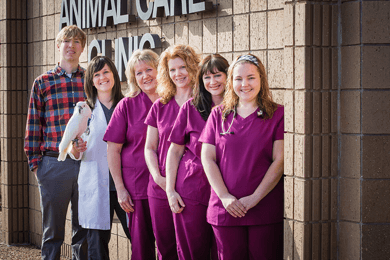 We hope you will stay a few minutes and get to know us, and more importantly, get a feeling for the kind of first-rate veterinary medical care we can offer your pet. We believe your pet is a much loved and valued member of your family, and as such, should receive great medical and preventive health care. If you are serious about your pet’s health, and if your goal is to keep your pet living a comfortable, healthy life for as long as you can, you have come to the right place! Preventing diseases and medical problems with a proactive comprehensive veterinary wellness plan accomplishes this goal, and this does so much more economically than simply treating medical problems and diseases as they arise, which was the common practice in the past. We hope you will let us work with you to craft a preventive care plan for your pet that sets them on the path to a healthy lifestyle, and keeps them active as a part of your family’s life for years to come!